Rights Victims Claims Board that will evaluate and process the claims of the human rights violations victims who will file their claim under RA 10368 or the Human Rights Victims Reparation and Recognition Act of 2013. 1. Ms. Amaryllis “Marie” Hilao-Enriquez – Marie, Chairperson of both SELDA and Karapatan, is a survivor of martial law. From her student days at the University of the Philippines up to the present, she has remained a staunch human rights defender. Marie, as a prominent leader of SELDA, led the organization of former political prisoners in the filing and proceedings of the class action suit against the former dictator Marcos in the US Federal Court in Honolulu, Hawaii. She is the daughter of one of the original plaintiffs in the Hawaii class suit. She likewise led the victims and their kin in the active lobby work for the enactment into law of the compensation bill that would indemnify and recognize the victims of martial law. She is a tireless human rights worker in engaging the various mechanisms of the United Nations in Geneva, Switzerland. 2. Mr. Bonifacio P. Ilagan – Boni, a multi-awarded writer, was twice arrested (1974 and 1994), tortured, and imprisoned. Boni’s political activism is expressed, among others, through his writings. He is currently the Vice Chairperson of SELDA, one of the mandated organizations under RA 10368 to submit nominations for the Human Rights Claims Board. 3. Former Representative Liza L. Maza – As a member of the House of Representatives for nine years, Liza introduced and advocated for the legislation of a law recognizing and indemnifying victims of Martial Law. 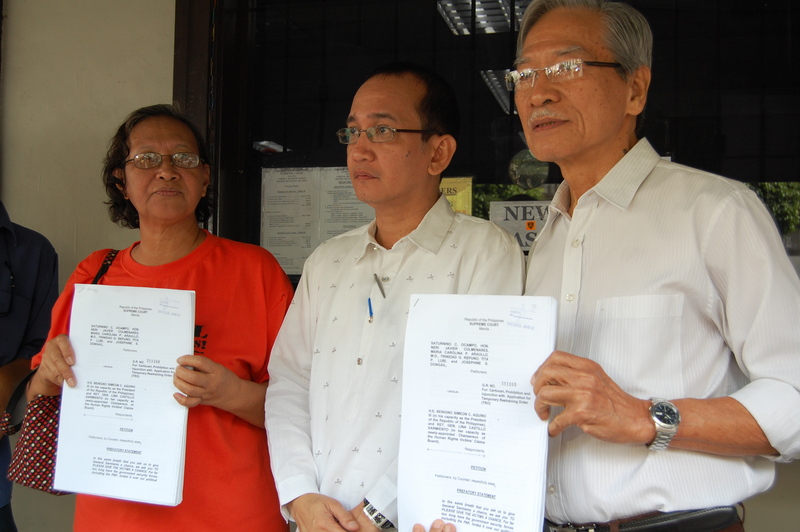 Ms. Maza, together with representatives Satur Ocampo and the late Crispin Beltran, filed the bill for victims of martial law, with due consultations with the victims, their relatives and lawyers. 4. Prof. Judy Taguiwalo – Judy teaches at the University of thePhilippines. She heads the Department of Women and Development Studies of the College of Social Work and Community Development. She was a member of the UP Board of Regents from 2009-2010. She is the recipient of an outstanding alumna award from the UP Alumni Association. She was detained twice, in 1973 and in 1984, where she gave birth inside prison. She is a board member of SELDA. 5. Dr. Edelina P. De la Paz – Dr. Delen de la Paz is Associate Professor in the Dept. of Family Medicine at the UP College of Medicine. She is also the Vice Chief of the Social Medicine Unit at the same university. Dr. Delen de la Paz has been involved in various health and human rights related institutions and non-government organizations. She is a respected alumna of the UP College of Medicine. 6. Atty. Romeo D. Candazo – a former political detainee, Atty.Ome Candazo is one of the founding members of SELDA in 1985. He is also a public servant having occupied various executive and legislative positions in the government; he served as a representative of the City of Marikina. He is a journalist, an educator and lecturer at the UP, Ateneo and Maryknoll College. But, first and foremost, Atty. Candazo is a human rights lawyer. 7. Atty. Kit S. Enriquez – Atty. Kit is the President of the National Union of Peoples’ Lawyers-Cebu Chapter and a member of the Board of Directors of the Integrated Bar of the Philippines-Cebu from 2005-2011. Atty. Kit was arrested twice during martial law (1972 and 1975) and was heavily tortured by the military. 8. Atty. Dominador A. Lagare, Sr. – hails from General Santos in Mindanao and has been a practicing lawyer since 1973. He was appointed OIC Mayor of General Santos during President Cory Aquino’s time. He has also served General Santos as city councilor for four terms. Atty. Lagare has been doing pro bono work for victims of human rights violations in the General Santos and Saranggani provinces. He teaches labor laws and negotiable instruments at the Mindanao State University. Twenty seven long years after the fall of the Marcos dictatorship, a law confirming the atrocities and human rights violations under martial law is finally signed into law. The Samahan ng Ex-Detainees Laban sa Detensyon at Aresto or SELDA, which led the filing of the historic class suit by the martial law victims against Ferdinand E. Marcos in a Hawaii court, welcomes the passage of the Human Rights Violation Victims Reparation and Recognition Act of 2013. This is another victory of the Martial Law victims in their continuing struggle for justice. Through their relentless efforts, finally and officially recognized are the heroism and sacrifices of all Filipinos who fought the dictatorship and were victims of human rights violations – summary execution, torture, enforced disappearances and all other gross forms of violations. They faced adversity, but took the courage to stand up and defend, not only theirs, but the people’s rights. The struggle was protracted. The process was agonizing and tedious. Scores of members of the Philippine Congress, in cahoots with the Marcoses and the military who vehemently opposed the passage of the law, tried to block its passing. In some instances, they deliberately delayed the process or watered down the crafted bill. Now, with a regime posturing as a “champion of human rights” and trying to score credits for its passage, the law was passed but mainly due to the persistent efforts of the martial law victims themselves. Tirelessly working hand-in-hand with progressive party-lists and likeminded legislators, the bill was finalized and ratified. Generally, the law is acceptable to the victims and survivors of martial law. We take this opportunity to commend and express our gratitude to Bayan Muna Reps. Neri Colmenares and Teddy Casiño, who stood with us since the filing of the bill, pursuing the most pro-victim provisions, and consistently pushing, on behalf of the victims, the legislature to finally approve the bill. We also appreciate the support of Senators Chiz Escudero and TG Guingona, and Reps. Edcel Lagman and Erin Tañada. Here and abroad, we were supported by various peace, justice and human rights advocates in the campaign for the bill’s passage. We extend our solidarity and gratefulness to solidarity groups in the United States, Hong Kong and Switzerland who warmly supported and mobilized in the campaign for the passage of the law, as well as in helping the victims every step of the way. We also thank the members of Parliament of Switzerland as well as its mission in Geneva for lending an ear to the victims’ pleas every time we lobby for their support. Most of all, we commend and deeply thank the members of the peace panel and consultants of the National Democratic Front of the Philippines (NDFP) who tirelessly asserted, in the process of all peace negotiations with the Philippine government, that the victims of Martial Law should attain justice. It is with pain and regret for us to witness the passage of this law at a time when many of our fellow victims and colleagues, who took part in the struggle against martial rule, have gone ahead of us. Also, there are still attempts to distort, sometimes even completely erase in the memory of our people, the dark days of the dictatorship. There are those among the architects of martial law who remain scot-free and unpunished. The most notorious culprits have been allowed to regain their political power and influence. Under the law, the Philippine government is obliged to recognize and give reparation to the victims of human rights violations during martial law. While all the sacrifices and heroism of the Filipino people during martial law is priceless, we see these both as an affirmation to the people who struggle for justice, and as a warning to those who will continue to impose fascism and terror upon the Filipino people. We dedicate this small victory to all martial law martyrs and heroes who have gone before us. We will continue to honor them, as we ensure that this law shall be implemented to the best interest of the victims and the Filipino people who survived martial law. We may be jubilant, but we continue to watch with vigilance. To fully ensure that the law will serve the rightful victims and claimants, we will try to make sure that the HRV Victims Claims Board shall be composed of individuals who, in one way or another, know and can feel with the victims and have been involved in the struggle against the Marcos dictatorial regime. We take cognizance that SELDA is part of the recommending entities to the Claims Board. We challenge the administration to appoint nominees of SELDA despite some government officials’ bias given SELDA’s political stands. Also, it should be ensured that those who are included in the master list of the 9,539 victims and those who will consequently file their claims are those who were genuinely part of the struggle against martial law. We should guard against unnecessary bureaucratic processes and scams which will deprive the victims of just indemnification. We should also take the opportunity to make the younger generation learn, understand and take on the challenge of having the same daring, vigilance, militancy and commitment to justice and human rights.